I have these three classic scopes I'm working on, so I can sell them to raise funds for our public observatory (see the thread I started on them a couple of months ago). I'm finished with the 8-inch Meade SCT, nearly finished with the 10-inch, and I thought today would be the day I had the 8-inch f/8 reflector on the Meade Research Grade mount ready to photograph and put up for sale (the mount is very clean and shiny!). But I ran into a problem: I got the RG mount with two different dual axis drives: the one that came with it from Meade, and an AccuTrack 4000. The problem is, neither works with the Dec drive. I posted about the problems with the Meade drive here. Long story short, both the RA and Dec motors work, but not together with that drive. I gave up on it because I was given the AccuTrack, and today I finally took the time to check it out. The thing came in a box with, no exaggeration, a dozen cords, but it turns out that none of them is the one needed for the Dec control! 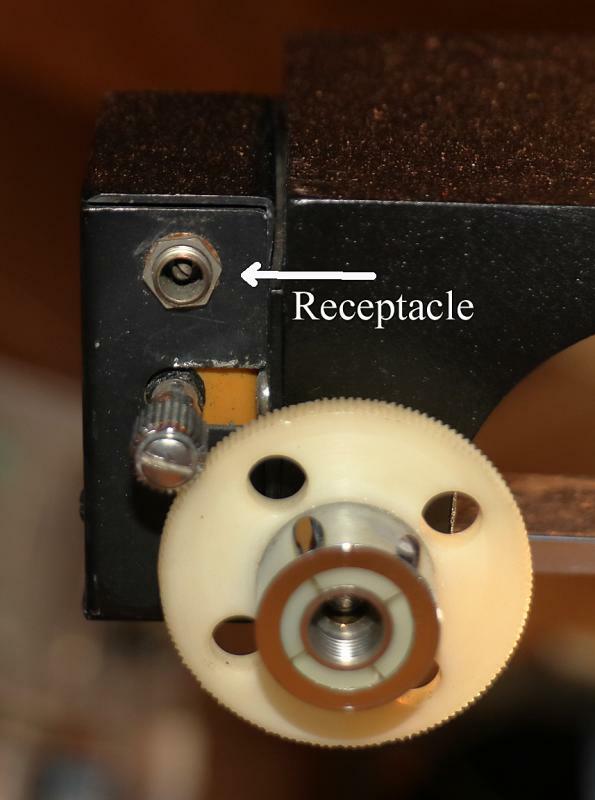 It's an odd 6-pin cord on the end that enters the AccuTrack, and it needs to go to a co-axial two-conductor that goes into the Dec drive on the RG mount. 1. What is the specific 6-pin male connector I need? 2. Where can I get one? 3. Which of the six pins connect to the two wires? If I knew the answer to question 1, I could probably find the answer to 2, but maybe not. 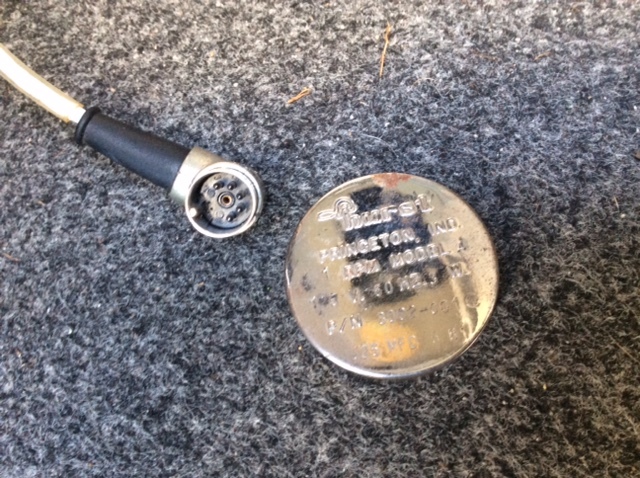 When I needed a cord for the 10-inch SCT mount, I looked high and low and finally found out it was no longer made (unless I wanted to order a minimum of 100 from China). So I ordered an old, used one -- one foot long! -- for $23. If someone has this particular cord, I'd be willing to pay for it, too, but first, I'm hoping for answers to my questions, if anyone has any. I'll post photos of the AccuTrack and the two ends the cord plugs into in a little while. Hmmm... When I started writing the original post, I was just going to ask if folks knew where I could find one of these cords, and it was only in writing that I realized that I might be able to make one. Sorry if the title is now confusing! Just out of curiosity, Paul, how many of the pins on the DEC plug are not used? I've always like Accutracks. I have three of them, but none are the 4000 Quartz. The Dec motor has you know runs off of DC voltage, most likely 12 volts. So at least two of the pins on the connector on the drive controller have +/- 12 volts on them. So all you need is a wiring going from those pins up your Meade Dec motor. The controls on the hand paddle turn on the power going to DEC and by reversing the polarity going to change the direction. So take the cover off the drive corrector ans see how many wires are going to the connector and using a volt meter see what the voltages are when the Dec control on the hand paddle is used. I just look at your other thread. I have repaired a number of drive controllers over the years and just last week I repaired an Accutrack controller for a friend. I would say 97% of the time when they don't work it is one of the output transistor that has gone bad. You said your son is good at electronics, so have him look at the two output transistors. I can see them in the picture of the Meade controller on the circuit board. They are going to be Darlington type and something like a TIP 120 or TIP 32. They cost about 50 cent each, just replace both the them and I bet the Meade controller will come back to life. Thanks for all the comments! I plan to sell this scope and mount, so I don't want to modify the equipment in any way. If I cannot get an actual cord, I'll try to make one by looking at the innards of the AccuTrack. My problem is getting the right plug for the 6-pin receptacle. Dave: thanks so much! Any chance you can tell me just which transistors those are in the photo? My son might just know, but he's not here to ask, and I'm very curious now! I would bet only two of the six pins are used. Maybe three tops. If three, it would likely be forward and reverse and a common. I would look at finding a different type of female receptacle to into the box. I think your idea of making one is likely the best bet. That's what I was thinking, three lines and a bridge if DC. They are the two that are mounted to rear of the case. They are mounted there to use the case as a heat sink . I can see two red wires coming from the circuit board too them . Those are for the signals turns them on and off. Then you have two wires that go from the transistors to the secondary winding of the transform, There is also a wire that is hooked to both transistor and that goes to +12. So how it works is when one transistor is on the other is off. They pulse 12 volts into the secondary winding of the transformer and the transformer boost it from 12 volts to 110 VAC. The pulse rate determines the frequency. If one of the transistor goes bad which is very common you don't get any AC coming out of the unit. Like I said they will be Darlington types and most likely a TIP120 or TIP32. 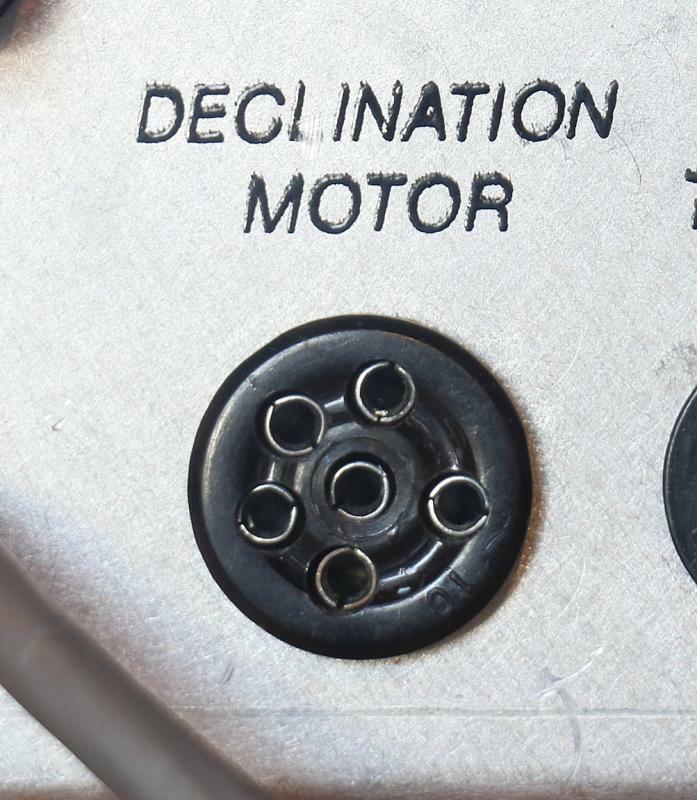 As for the DC DEC motor you need only two leads not three. To change direction of the motor you just flip the polarity going to it to change the direction. You can see four transistor mounted on the circuit board. They make up an H-Bridge which controls which connection to the motor is positive and which one is negative and allows them to be flipped to change the direction. Thanks, Dave. My son has looked things over and is having trouble finding TIP32 Darlington transistors online. He says the transistors in the drive definitely are TIP 32s. He has found PNP TIP 32s, but not Darlingtons, and wonders what to do next. If there are Darlington TIP 32s, can you tell us where to find them? I'm also getting quite frustrated with the Meade RG mount. I've done a lot on it, and it looks great, but lately everything is going awry. Two drives that I cannot get to work, and now, having put it all together, after putting the scope on it, the RA axis squeaks terribly when I move it manually. Before mounting the scope, it didn't do this, and last night, when collimating the scope, it didn't either, but now.... Every metal surface either has a plastic ring or grease isolating it from any other metal surface, and yet it sounds like an old windmill grinding in a breeze. And I cannot figure out just where the sound is coming from, either. It seems that it's resonating throughout the whole mount. Still, the loudest place seems to be, of course, the one place that is hardest to disassemble. So hard, in fact, that I was not able to get it entirely apart when I did my best to get everything cleaned up. I know this rant is entirely off-topic, but I just felt the need to blow off steam to folks who might empathize. I really don't want to go back to square one with this thing! If I planned to keep it, things would be different, but knowing that I may have a hard enough time finding a buyer willing to pay much for it if it is in great shape, spending so much time and effort gets difficult. I think this will end up being a great scope and mount combination, but the market for it will be small. It's large and heavy; a 'garage scope'. There are folks out there (many of them here) who know the value of such a scope, but it's not a big crowd. Edited by PaulEK, 20 October 2018 - 06:29 PM. Well, that turned out better than I might have hoped: I just had the clutch too tight. It still makes a rubbing sound, but that's as it ought to be. Maybe the change in weather (it's much drier and colder today) changed something to make it squeak. Now, to re-position the primary. When I checked it out last night, I found that, for whatever reason, the scope would not come to focus until I lowered my 1.25" eyepieces well into the 2" tube. This scope has a mysterious history: donated to our club, clearly ATM. Maybe they made a miscalculation when making it and just set it aside. Or maybe someone put a taller focuser on it and never tested it afterwards. I could get a new, shorter focuser, but would need to re-drill holes for it, too. I'll just move the primary up the tube. A Darlington is a type of transistor like a Kellner is a type of eyepiece so what you want is TIP32's I just got a handful from Jameco https://www.jameco.c...ogDrillDownView I got TIP32C since they can handle more power. Your son needs to figure out were the broken wire in the hand controller goes. That is part of the circuit that makes the timing that pulses the transformer. If that part isn't working then that could also be the problem. 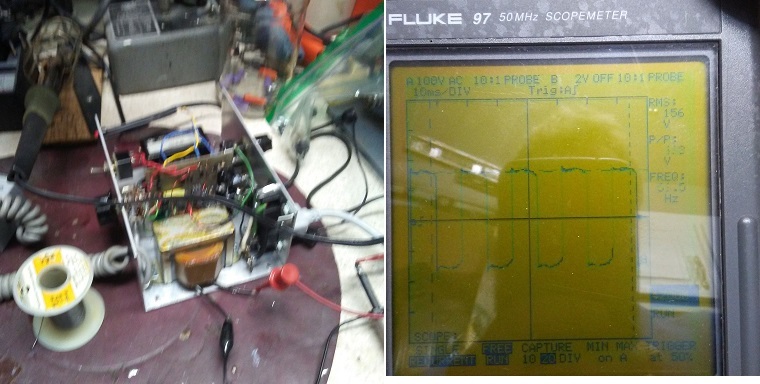 Here is a picture of the AccuTRack that I just fixed for a friend and the square wave output on my oscilloscope. Like I said on this one the problem was again the TIP 32 transistors. Edited by DAVIDG, 21 October 2018 - 05:34 PM. Well, this is a bit off topic, but I am looking for a drive corrector/dec control for an old Schaefer mount. It uses a connector that looks remarkably similar to what you are dealing with. So if anyone following this thread has once the might be willing to sell, please let me know. Edited by ltha, 23 October 2018 - 04:15 PM. Meade LX3 drives use the TO-220 TIP 30s. Do yourself a favor and replace them with MOSFETS. I've used Motorla SPP08P66P (20 for a buck) MOSFETs to replace the TIPS. TIPs blow away half the current they are fed as heat. MOSFETs are much more efficient. I've seen TIPs melt the solder connect them to the circuit board. 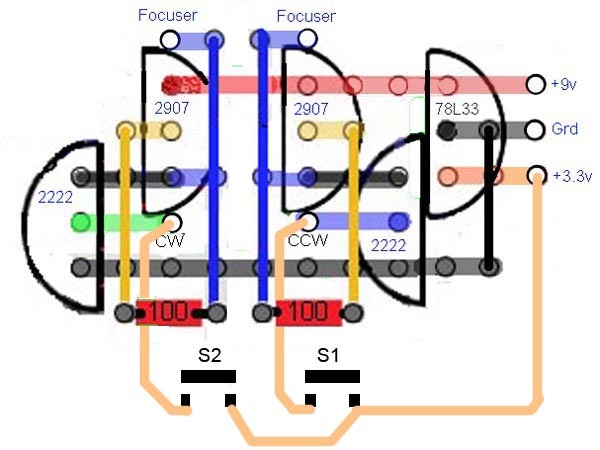 As there's only two conductors to the Dec drive reversing the polarity of the signals is the only way to reverse the drive. You can do this with two DPST switches or SPST switches and two relays. You can build a H-bridge with a couple of momentary switches and transistors or MOSFETs or a quad half-bridge IC like a L293D. If you are really cheap you can build one for five cents by omitting the voltage regulator. Edited by Geo., 24 October 2018 - 09:15 AM. Thanks for the continued tips! If I were keeping the scope, I would explore upgrading the drive, but I plan to sell it for a reasonable cost to raise funds for another cause. I'm mostly responsible for taking this thread off its original question, so I apologize again for that. It would be great to get the Meade drive back in working condition, but I may have a perfectly fine AcuTrack 4000 drive that would be more versatile. I just need the proper cord for it. I will gladly make it, but don't know the proper 6-pin plug to get. I thought I had found someone who could supply it, but he drew a blank. If someone could look at the photos in the OP and see just what plug I need, I'd be grateful if you'd tell me just what to look for. Again, I don't want to take the time and effort to modify anything if I can avoid it. If it would help, I could take another photo with a ruler next to the receptacle on the back of the AccuTrack. Just let me know! As for the wiring if you take the cover off the unit and take a picture of the wires going to the female plug it will be pretty easy to figure out how to wire up the male end. HA! Thanks, Dave!!! I just ordered one from your linked site. If I can get this to work, I'll be finished with this kit: RG mount, 8-inch f/8 reflector, and dual axis drive. Sweet! Ah, well, another setback. The 6-pin plug at that link is not the correct one. The AccuTrack needs one that is both quite a bit larger and without the circular metal wall that came on the linked plug. I've looked for what I think it must look like and cannot find anything, so the next step is to simply disassemble the AccuTrack and just solder the wires of the cord to the proper places. I didn't want to do this, but the scope and mount are ready for sale. I decided to do a bit more than what I wrote above. I modified the AccuTrack 4000 so that I can simply plug in the 1/8th inch headphone plug on the cord I have. I really didn't want to modify the controller, but at least it can now be easily used with this mount.